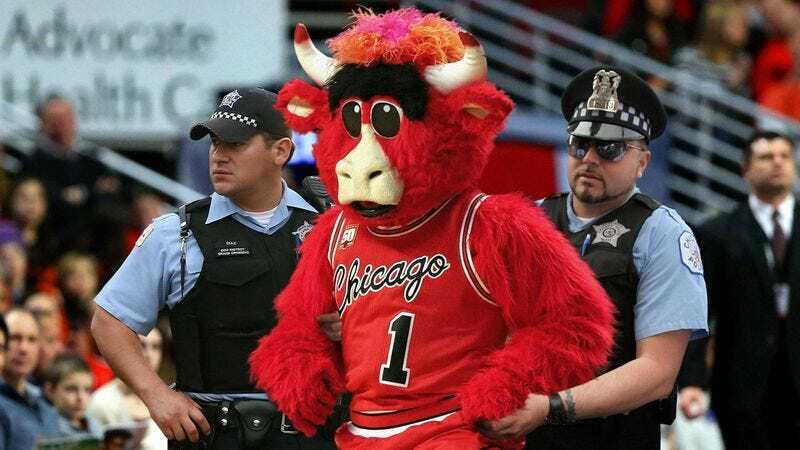 CHICAGO—Noting that the suspect had been taken into custody after officers managed to tackle and wrestle the individual to the ground of the United Center concourse, police confirmed Monday that Chicago Bulls mascot Benny the Bull was arrested for possession of an unlicensed T-shirt gun. “The suspect was driving erratically on his motorcycle when we pulled him over to the side of the court, at which point we uncovered a weapon hidden on his person,” said Chicago police officer Isaac Guerrero, adding that Benny the Bull then fled from authorities on foot, eventually jumping off a trampoline, somersaulting through the air, and barreling through several cheerleaders who were blocking his path. “The suspect then began firing indiscriminately into the crowd before tossing the weapon into a trash can. Upon recovering the T-shirt gun it was clear the serial numbers had been filed off, and we later discovered over 300 rounds of T-shirts stockpiled in his storage locker.” In addition to the current weapons charges, officers said that Benny the Bull might face further prosecution if ballistic experts can successfully link the T-shirt gun to several unsolved shootings at the United Center.